Naknek, AK – For the second year in a row Bristol Bay Borough School District in Naknek graciously hosted a one week Radiation Safety training session as part of the Career and Technical Education (CTE) program designed to introduce high school students to the field of Non-Destructive Testing or NDT. CTE programs give high school students the chance to get a head start on prepping for college and careers, and demonstrate to students how core school subjects, like math, are used in real-life. NDT can be described as a wide group of information gathering tests and inspections used in science and industry to evaluate the integrity of materials, components, or systems without causing damage. Examples of NDT can be found in almost any industry ranging from ultrasonic detection of corrosion on pipe lines on the North Slope of Alaska to x-ray imaging of aircraft components. Kakivik Asset Management, a subsidiary of Bristol Bay Industrial, provided equipment and instructors for the week of training. Bobby Phillips, Prudhoe Bay Quality Assurance Coordinator, and Ian Moreau, Corporate NDT Level III, took seven students from the Bristol Bay Borough and the Lake and Peninsula School Districts through the industrial radiation safety course. This course is required to perform industrial radiography, an NDT method that utilizes x-rays or gamma rays to inspect very dense materials for damage caused by water in oil pipelines. Students received instruction in the scientific principles of radiation safety and how to keep the general public as well as industrial radiation workers safe from potentially harmful radiation levels. Hands-on application, utilizing current industry standards and training equipment, allowed the class to create standard radiation boundaries, calculate radiation doses, and perform mock radiation surveys. 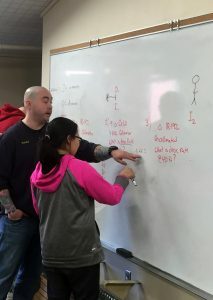 Students who completed Kakivik’s second annual NDT course received college credit hours from the University of Fairbanks.